Arlington Heights is a Northwest Portland neighborhood located on the Northwest Hills near Washington Park overlooking Downtown Portland and the Willamette River. Homes for sale in Arlington Heights are some of the most beautiful and desired homes in Portland, nestled into the lush greenery of Forest Park, where life is good and the views are even better (Arlington Heights is located 1000 feet above the city!). Though homes in Arlington Heights can be some of the most expensive in the Portland area, home prices are dropping quickly, and now is the perfect time to find your dream home in the trees. The commute from Arlington Heights to Downtown Portland for work, dining, entertainment, and shopping, takes less than five minutes, but residents feel a world away (or above) the hustle and bustle of the city. We love the West Hills because they offer a quiet, secluded, park-like atmosphere with views and a sophistication that reminds you how close you are to the best that Portland has to offer. Miles of trails traverse the West Hills, especially throughout Forest Park, offering a haven for active families and happy pets. You'll feel pampered by the welcoming environment of beautiful homes, outstanding schools, and amazing views of the best city in America. Arlington Heights was developed with the wide-spread ownership of automobiles allowed residents to "look to the hills" for developments. As early as the 1920's, Arlington Heights was one of Portland's most elite neighborhoods. One look at the views from the homes in tree-filled Arlington Heights and you'll know why Portland's wealthiest have made the West Hills their homes for a century. Arlington Heights is bordered by the Northwest Heights, Sylvan Highlands, Hillside, Northwest and Goose Hollow neighborhoods. Arlington Heights is located near some of the best schools in Portland, including Ainsworth Elementary School (2425 SW Vista Dr.), West Sylvan Middle School (8111 SW West Slope Dr.), Lincoln High School (1600 SW Salmon St.). Forest Park: Forest Park, the nation’s largest city park, lies near Arlington Heights, and stretches for more than 8 miles on hillsides overlooking the Willamette River, where more than 112 bird species and 62 mammal species frequent the park’s wide variety of trees and shade-loving plants. Forest Park offers enjoyment to hikers, bicyclists, runner, and others who just enjoy being outdoors in a forest atmosphere. The 30+ mile long Wildwood Trail (a National Recreational Trail) traverses the Park from the Vietnam Veterans’ Memorial in Hoyt Arboretum to Newberry Road - and it's all in Arlington Height's backyard. How could it get better than that? Washington Park: Arlington Heights is near the attraction-packed Washington Park, home to the Oregon Zoo (home to more than 1000 animals), the International Rose Test Garden (the oldest official rose test garden in the US), the World Forestry Center, the Oregon Vietnam Veterans Memorial, Hoyt Arboretum (home to over 10,000 trees of 1,100 species), the Portland Japanese Garden, the Oregon Children's Museum, and easy access to the Washington Park underground station to take advantage of MAX Light Rail transit into the heart of Downtown Portland. During the summer months, the Washington Park and Zoo Railroad takes visitors on a peaceful trip around the park, including the Rose Garden and the Oregon Zoo. The train was built in the 1950's and is a charming way to enjoy the scenery and history of the area. 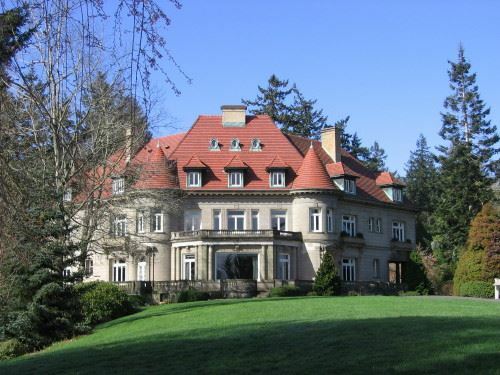 The Pittock Mansion: 3229 NW Pittock Drive, (off NW Burnside) The grounds provide lovely walks and picnic areas, and those who wish can hike to the mansion from nearby parks. The sweeping views from the mansion and grounds overlook Portland's downtown and Willamette River. Forest Park Wildwood Trail: The 30-mile Wildwood Trail in Forest Park is part of the region’s 40-Mile Loop system that links Forest Park to pedestrian and trail routes along the Columbia River to Gresham, through southeast Portland, along the Willamette Greenway, and back to the Marquam Trail in southwest Portland. A landmark on the trail is the Stone House. This structure was built in the mid-1930s by the Works Progress Administration (WPA) as a public restroom. The infamous Columbus Day storm on October 12, 1962, took out the water line. Because the structure had been heavily vandalized over the years, the decision was made to gut the building rather than embark on costly repairs. It remains as a favorite spot to rest along the trail. 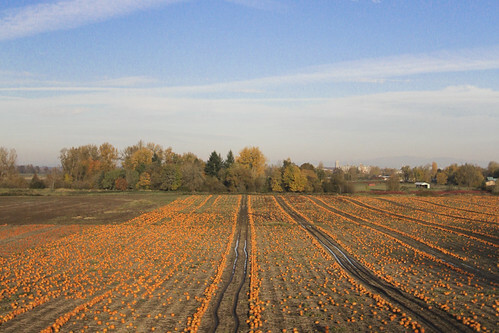 Feast on roasted corn and warm cider when you pick your pumpkin at Kruger’s Farm on Sauvie Island. Visit the farm and you'll find a market, canning supplies, farm animals and the freshest local produce around. Phil's grill is now open on weekends serving up great farm fare and BBQ. Grab a pint of beer or a hot dog and enjoy the surroundings. You'll even find a few chickens pecking their way around your table! Count on one of the biggest corn and pumpkin patch mazes you’ll ever get lost in each and every fall season. For a small entrance fee explore with the family the twists and turns of each maze, and they’re open after dark so bring a flashlight! Seasonally, they open earlier than other mazes so you can miss October rains. Their staff is friendly, knowledgeable, and not afraid to come find you when you lose your way (they’re affectionately known as the “Corn Cops”). Arlington Heights is, overall, one of the older neighborhoods on the West side, as more than 60 percent of the homes were built before the 1940's. Many are stilt homes, built on steep hills to take advantage of the amazing views. The Arlington Heights area boasts a diverse selection of architectural styles, ranging from Victorian cottages, Tudor beauties, classic Northwest, to Colonial, to Mediterranean (and a lot of custom design in between). Homes for sale in the Arlington Heights Real Estate market are often higher-end luxury homes with amazing views and custom details, though amazing deals can be found at this time in the Portland real estate market. Residents of the West Hills have immediate access to the dining and shopping opportunities of Downtown Portland, the Pearl District, and the best of Nob Hill. Some of Portland's best restaurants are within an easy 10 minute drive from your hilltop home. In 2005, the Forest Heights Village Center opened its doors as the area's first shopping center with dining, coffee shops, dry cleaning, a hair studio and even a spa. Skyline Restaurant - 1313 Northwest Skyline Boulevard - This classic diner serves up great burgers, fries, and milkshakes, perfect for a rest stop on an afternoon drive along Skyline Boulevard. They also serve up a mean breakfast. One of the last standing drive-ins in Portland, this historic spot features 1950's decor and menus, as well as summer car hops. Skyline Tavern - 8031 Northwest Skyline Boulevard - A Portland landmark, Skyline Tavern has sat upon the hill overlooking Beaverton and Hillsboro for over 50 years. Here you can watch the sun set over the city while playing horse shoes, pool, ping pong or darts. Music inside and out and a great beer selection. Come up the hill and view this extraordinary "Saloon" from the 40's and all it's antiques, atmosphere, and unsurpassed beauty. Anna Bannanas - NW Portland's oldest independent coffee house has lots of perks: great coffee and staff, wifi, subtle music, laid back atmosphere with the "aged in a good way" feel, and they're dog friendly. Hours are open early, close late for whenever you have your coffee craving, and they serve some of the best chocolate milkshakes around. The menu is made up of pastries, breakfast choices, sandwiches, smoothies and shakes; there's also lots of comfortable seating to enjoy your coffee and book. 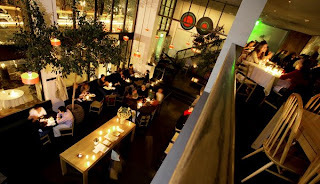 23Hoyt - This comfortable, sophisticated restaurant is where the resident food community feels at home. 23Hoyt's philosophy is "A New American Tavern" which combines bar menu favorites, like grilled burgers and fish & chips, with comforting Pacific Northwest classics such as grilled wild salmon, and a double cut pork chop with sweet corn and chanterelle succotash. The café, bar and dining room feature several seating areas, (including outdoor seating on NW 23rd Avenue) simultaneously providing warmth, comfort and refinement to customers while they dine on delicious "wow" food. Papa Haydn - For 24 years Papa Haydn has been the popular stop for desserts thanks to the family-owned restaurant's focus on high quality foods, beverages, and service. But they don't just offer amazing desserts like Triple Chocolate Torte, Raspberry Gateau and Banana Cream Pie. The duck duck salad, is a delicious and modest dish of heaping fancy greens, two types of prepared duck and topped with an egg. Their menus change frequently, allowing them to take advantage of seasonal fare and keep their prices wonderfully modest.